The smart plug works effortlessly with Amazon Alexa, Google Assistant and IFTTT to give you hands-free voice control over your devices. Pair the plug with these commands to turn on your lights, your appliances, or an entire room on or off with just the power of your voice. The smart plug uses your existing home Wi-Fi network to provide wireless control of lamps, heaters, fans and more - with no subscription or hub required. 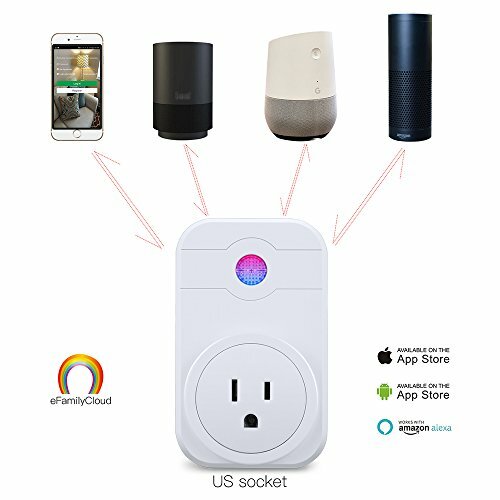 Simply connect the smart plug with an electrical outlet, plug a device on and control it easily using the free "eFamilyCloud" App. You'll never have to worry that you accidentally left the space heater or iron on again. What's more, the overload protection makes sure that when the voltage and current are over the standard, the plug will automatically go power-off to ensure home safety. The smart plug lets you easily set automatic schedules for any device that's plugged in - from lamps to fans to space heaters. By using the free smartphone application, you can save your time and keep your home comfortable by pre-toasting the breads before getting up, scheduling a fan to turn on at noon, or synchronize a lamp with the sunset so you never come home to a dark house.